Living and eating greener means spending a lot more time in the kitchen – it’s easier to incorporate ‘real food’ into your diet and regulate your plate when you cook at home. 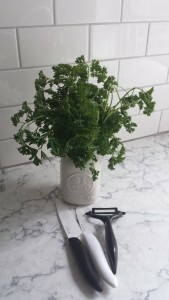 Here are the top five items I’ve learned I absolutely cannot live without as an amateur chef – and aspiring sustainable saint. This is definitely not a plastic bag. 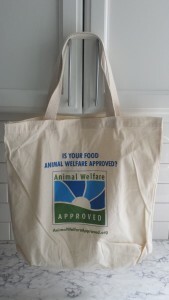 Any self-respecting green shopper will always have at least one reusable tote tucked away in a pocket or a purse, for carrying those valuable groceries home. We use and toss between 500 billion – 1 trillion plastic bags a year worldwide (with over 100 billion in the United States alone!). Less than 5% of these are ever recycled. Plastic doesn’t decay. A petroleum-based substance, it can take up to 1000 years to break down (if it ever does at all). In the meantime, this non-biodegradable toxic rubbish is littering our parks and choking our oceans. Discarded plastic bags kill over one million seabirds – and 100,000 marine animals – a year. At least. Toxic particles from this accumulating mess are also slowly contaminating our soil, water supplies and bloodstreams. And that’s just the good news. Carry your own. It’s not that hard to say ‘no’ to disposable and it’ll mean one less billowing piece of junk on the beach. That’s enough of a reason for me. In our earnest attempts to be healthy and hydrate, we charge through 50 billion plastic bottles of water, worldwide, each year (30 million in the United States). Only about one in six is ever recycled. The rest end up in escalating landfills or causing yet more devastating and unsightly pollution in our oceans and beaches. Here’s another statistic worth thinking about: 93% of Americans now exhibit detectable levels of Bisphenol A (BPA) in their systems. What’s BPA? It’s a high-volume synthetic estrogen disruptive to the endocrine system which has also been linked to numerous cancers, reproductive disorders, obesity and heart disease. It’s also one of the most common synthetic chemicals used in the production of commercial plastics, most notably, our food containers and disposable beverage bottles. Go figure. One small way to make a difference is to choose tap over bottled water. Tap water is generally well-regulated and monitored for safety but if you worry about industrial, commercial and medical contaminants (you should), it’s not a bad idea to invest in a quality filter. The Environmental Working Group has produced a useful summary of the different types of filter technologies available. I have two large PUR-18 cup dispensers – one in the fridge to chill drinking water and the second in a cupboard for cooking and coffee/tea-making. They do just fine. 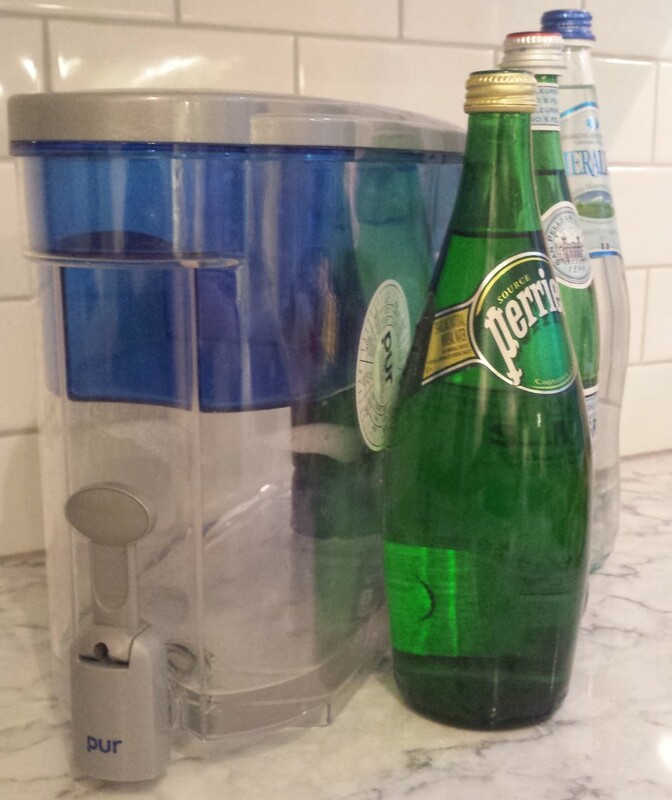 If I need some sparkle and bubbles in my life, I’ll go for the recyclable glass water bottles over plastic. Sometimes, for all its placid goodness, water can get repetitive. Sparkle and bubbles notwithstanding. Bring sunshine to a simple glass of H²O with a spritz of lemon, lime or orange and enjoy a refreshing, healthier alternative to syrupy store-bought sugarades and highly concentrated fruit juices. 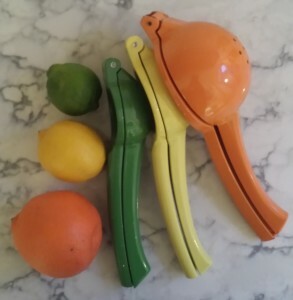 This is a task made incredibly easy with these brightly colored gadgets, which can also be used to infuse a spark of citrus into sauces, home-made salad dressings and fish with minimum fuss. Love them. Slicing, dicing, paring and peeling are some of the most arduous tasks in the kitchen, even for the most enthusiastic of home cooks. Having efficient tools to hand makes the process of processing food at home less of an ordeal. The first time I experimented with ceramic blades I was hooked, but it’s a precarious relationship to say the least. 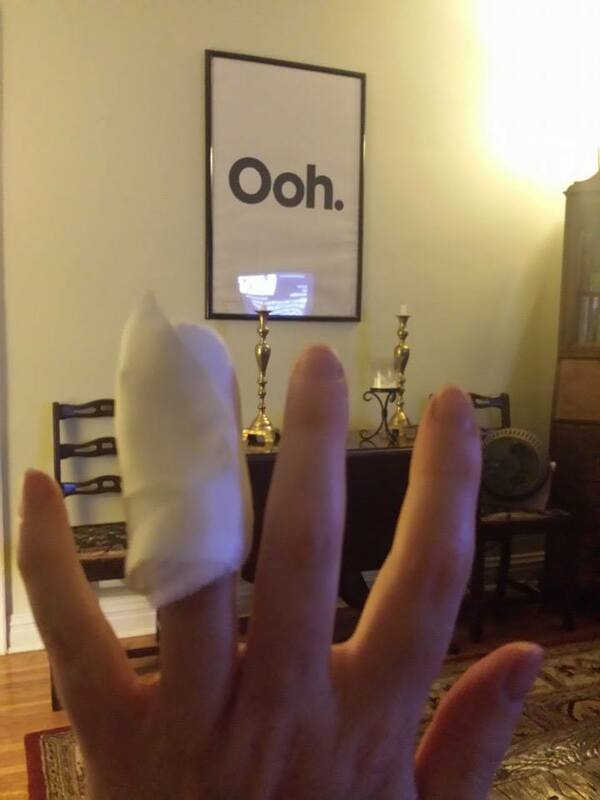 The result of using a ceramic knife in a hurry. The ceramic peeler can shave a potato, a parsnip, or a thumb free of skin in seconds. The ceramic knife can slice juicy tomatoes into paper thin wafers and make elegant, translucent ribbons of zucchini. 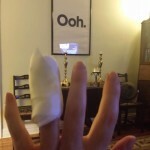 It can also cut quite cleanly through the tip of an unsuspecting finger before you even realize what’s happened. For these reasons, and speaking from personal experience, it’s best not to carry on a conversation, read a recipe book or watch television when using one these treacherous, yet hopelessly addictive, slicing devices. Treat with caution and respect. Eating real, whole food is immensely satisfying but it can be labor intensive. Fresh market vegetables and salads don’t prep themselves. It’s much easier to stick to the program if you do a little planning in advance. That way, you’ll always have snacks at hand and don’t have to spend as much time organizing each meal before cooking it. When storing your home-processed foods, opt for glass not plastic containers. When I get back from the market on Saturdays, I’ll rinse and chop my vegetables for the week and separate into my spectacular collection of little and large glass storage bowls. Then each evening for dinner, all I have to do is pick a protein, grab some shredded kale, a handful of carrot batons, a few florets of cauliflower or trimmed green beans and I’m ready to start cooking. Sorting all your freshly prepped food (and leftovers) into little and large glass bowls also ensures order and clarity in what might be an otherwise chaotic fridge. And yes, of course it means you are a bit of a nerd.